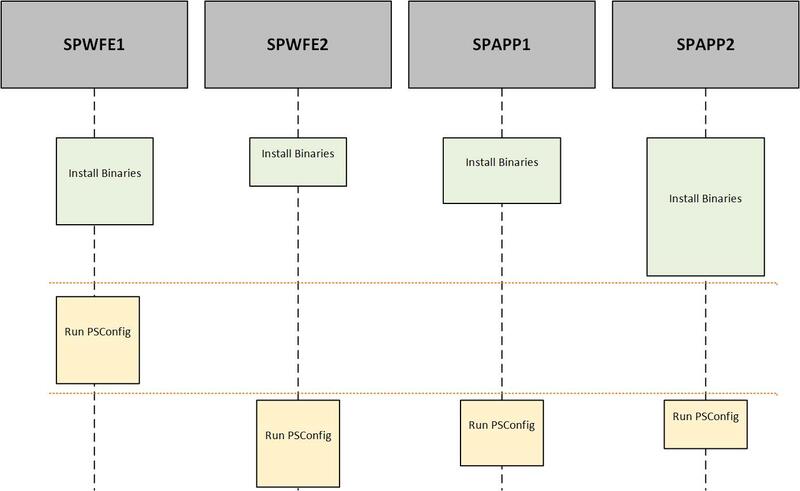 While I already have an article that covers the details of how you can use PowerShell Desired State Configuration (DSC) to patch a SharePoint Farm, I wanted to write a second article that covers the process of patching a multi-server farm, while respecting a sequential upgrade logic. Starting with PowerShell 5.0 we can now specify cross-node dependencies, which mean a node can wait for a specific resource to be in the desired state on another server before proceeding with the configuration of a given resource on the local node. By combining this new feature with the SharePointDSC module, we can fully automate our sequential upgrade sequence. If we were to put this into words, we should be able to install the binaries on all servers in parallel. The installation process may take longer to complete on some servers compared to the others. Once that is completed on all servers, then we should be running PSConfig on one server in the farm, and whenever the process finishes on that first server, then we can go an run it on all other servers in parallel. The orange dotted lines on the diagram represent “logic gates”. The first one, indicates that you should not be running PSConfig on the first server until the binaries installation process has completed on every server in the farm. The second one, specifies that we need to wait for the PSConfig process to finish on the first server before attempting to run it on the another server. These dotted lines will be represented by the Cross-Node Dependency resources WaitForAll in our DSC script. $CredsSPFarm = Get-Credential -UserName "contoso\sp_farm" -Message "Farm Account"
BinaryInstallTime = "2:00am to 8:00am"
DatabaseUpgradeTime = "2:00am to 8:00am"
The above DSC script is very good for patching sharepoint but with downtime. Since, SharePoint 2016 supports Zero Downtime Patching (ZDP), Is it possible to use DSC to support ZDP for sharepoint 2016 ?